We were delighted to be finalists in the SDC Innovation Awards 2014. Designed to recognise those at the pinnacle of achievement in coloration innovation, last year's Awards attracted entries from 17 countries worldwide. 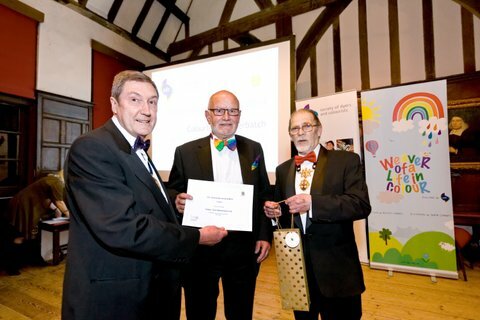 Tony Gaukroger, centre, md of Colour Tone Masterbatch, receiving the award from SDC's President, Richard W Straughan (left) and The Sheriff of York, Councillor Brian W J E Watson (right). We didn't win but are gratified to be one of three finalists in the SME sector. Our entry was based on the colouring technology work we undertook to develop colourants to allow Near Infrared (NIR) spectroscopy to sort black plastic packaging waste so it can be recycled. This work is already creating new revenue streams for processors while delivering, savings in carbon emissions, reducing landfill volumes and contributing to saving the planet.